A few weeks ago I had an experience - one that I will remember for a lifetime. Along with several dozen teachers, I flew aboard a jet aircraft as it went through a flight profile designed to produce authentic weightlessness - the kind space travelers experience - albeit in small, bite-sized chunks. Alas, the experience was far too short for my liking. As someone told me just before we took off, this can become addictive. I can see why now. I'd love to do this again - and again. 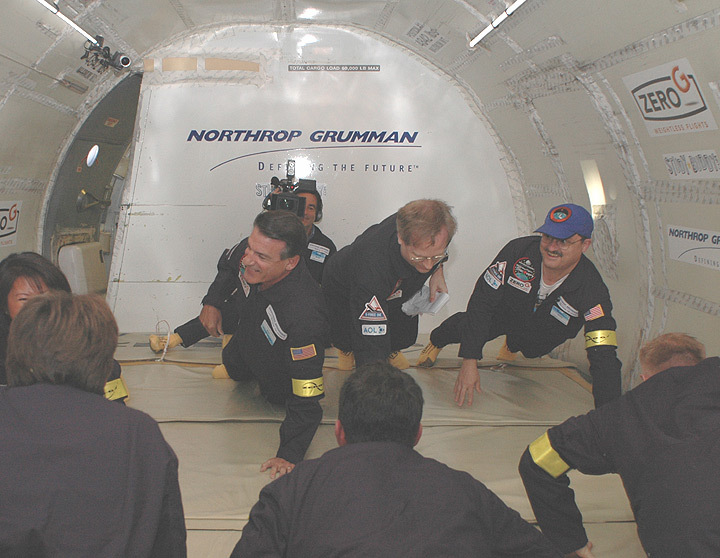 I was along for the ride as a guest of Northrop Grumman Corporation who purchased a dozen flights from Zero Gravity Corp. for the prime purpose of exposing teachers to weightlessness. With a per seat cost averaging around $4,000, the total cost of the program is certainly close to $1,000,000. The hope is that the teachers will then translate this unique and exciting experience into lesson plans for their students - instruction that will serve to motivate and excite students to study math, science - and perhaps to pursue a career in space exploration. Based on what I saw these flights would have precisely that effect on the teachers - and through them, upon their students. Indeed, the effect is nearly instantaneous. The teachers could not wait to get back to their classrooms. In addition, I found that this flight was not an isolated event, but rather one of an arc of experiences that would unfold for me in the coming weeks - experiences whereby I learned some interesting things about the inherent flexibility of my 50 year old vestibular system. What follows is broken into two parts - the first part being a description of this marvelous program and the effect it has had on the participants. The second part is my own personal observations and thoughts. At a time when NASA's interest in developing the next generation of space explorers seems to have stalled and begun to fade, others have moved in to fill the gap. Northrop Grumman serves as the prime sponsor for the "Weightless Flights of Discovery program". 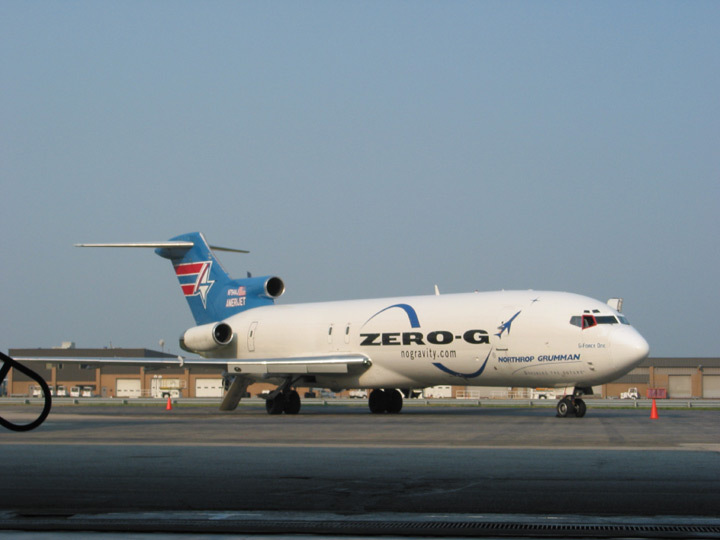 This project utilizes Zero Gravity Corporation's Boeing 727 airplane ("G-Force One") and staff to conduct a flight program for teachers. In addition, the Florida Space Research Institute provides national funding support and AOL serves as the program's official online website. Now, completed, the program flew 250 or so teachers on 12 flights - with two flights conducted in each of 5 locations across the U.S. All told perhaps 10,000 students will directly benefit from the experiences of these teachers. In addition to Cleveland (where I flew), flights originated out of Kennedy Space Center, Florida; Huntsville, Alabama; San Diego, California; and Washington Dulles Airport, Virginia. According to Tom Vice, vice president for business development for Northrop Grumman's Integrated Systems sector: "Our goal has been to provide teachers and their students with a renewed enthusiasm for the learning process, and show them that technical subjects are not only entertaining, but downright interesting. From the initial feedback we've received, we're confident that we've given the next generation of space explorers a flying head start on learning that math and science are not only fun, but also cool. We expect that many of them will go on to make significant technical contributions to the nation's future and its global competitiveness." When you talk with Northrop Grumman personnel you can actually see a twinkle in their eyes when you ask them about this project. When the teachers are present the enthusiasm rises more. When the teachers actually return from their flights, the emotions rise to a crescendo. This is not a standard corporate PR dog and pony show. This is something all together different. Large aerospace corporations are not at all shy about spending a lot of money on PR. Usually, the money is spent on receptions meant to exert influence, or large newspaper ads aimed at swaying government officials as they make decisions. This expenditure was unique in that the benefit derived from this project resided principally outside the Washington, DC Beltway. Moreover, the true result may not be known for many years - perhaps decades. As I got to know the people involved in this event, it became abundantly clear that they too saw this as a special program - and that they poured an extra amount of personal effort into it beyond what their jobs called for. Watching them as the last flights landed at Washington Dulles you could see a mixture of relief (for a complex job completed) and sadness that something had (at least temporarily) come to an end. In addition to paying for a series of preparatory teach workshops and the cost of the flight themselves, the Northrop Grumman Foundation has also provided $250 grant to each of the teachers who participated in the program. Budgets being tight as they are, money like this can mean the difference between an adequate educational experience, and a memorable one. I have seen examples where a small amount of money (in the grand scheme of things) can have a potent effect. During a trip with (former) NASA Administrator Sean O'Keefe in 2003, I saw an Explorer School in Lorain, Ohio. The town - and the schools - were clearly experiencing bad times - yet the small grant NASA had given the school had led to a transformation albeit brief when it came to the teaching of space education. This money was like a gift from above and allowed teachers to expose students from an economically depressed region to things that would normally be reserved for students in richer school districts. I think this is wonderful since all students dream- yet those who have less often rely more on dreams - and such grants often serve to transform dreams into reality - dreams that might otherwise fade. The flights we took were brief (far too brief) but they were magical. And in the case of the teachers, profoundly instructive. I can't think of a better way to illustrate the concepts of "mass' and "weight". The process of creating periods of weightlessness is rather straightforward. To be certain you're not losing weight because you are higher or going faster. Rather, you are being put - for a brief period - into a position whereby you fall along a controlled path. Done at the right altitude, trajectory, and speed you can fall around the Earth and be in what is more commonly know as an "orbit". We were not in what most people think of as an orbit, yet the principle was exactly the same. 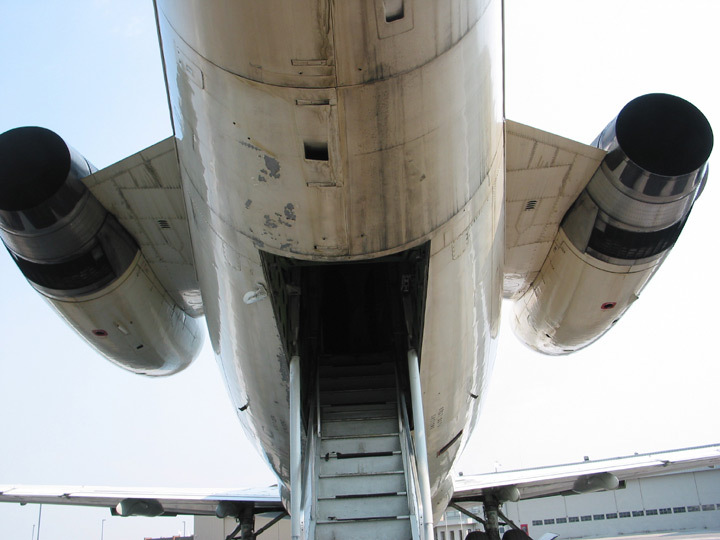 The plane climbs upward on an arc at an angle of 45 degrees. 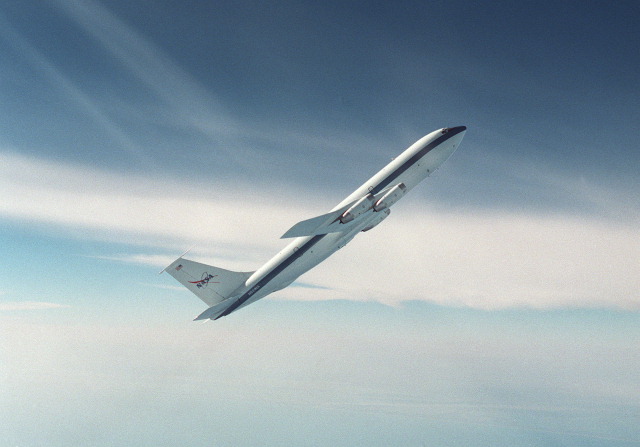 As the plane reaches the top of this arc at around 34,000 feet, occupants experience 25-30 seconds of weightlessness. Drive really fast over a road with sharp little hills and you will replicate this process to a certain extent. The plane then heads back toward Earth. It does not dive, but rather, it drops. In essence, you fall (hence the weightlessness) and the plane falls with you (protecting you from wind) in a way so as to eventually catch you. The plane descends at a gentler angle of 30 degrees down to around 24,000 feet. As it catches you and pulls out of the dive all aboard are exposed to 1.8G as it prepares to climb once again. The research flights NASA uses often fly dozens of these parabolic maneuvers. The term "parabolic" is used to describe the overall flight profile. As such NASA jargon includes phrases such as "flying parabolas" and "doing parabolics" to describe the experience. Of course, with names like the "Vomit Comet" affixed to the planes NASA uses, there is a bit of a bum rap associated with the experience. To be certain, flying these sorts of flights can make people sick - but there are ways to dramatically reduce the chance of sickness - to the point that the ride (as I took it) is far less likely to make you sick than whale watching or reading in the back seat of a moving car. While some people are immune to the side effects of this back and forth transition between weightlessness and twice their weight, the more you do this the greater the chance that you'll eventually get sick. How quickly you make the transition also seems to be a factor - although many aspects of why people get sick in weightlessness are still somewhat of a mystery - and the focus of a lot of NASA research. 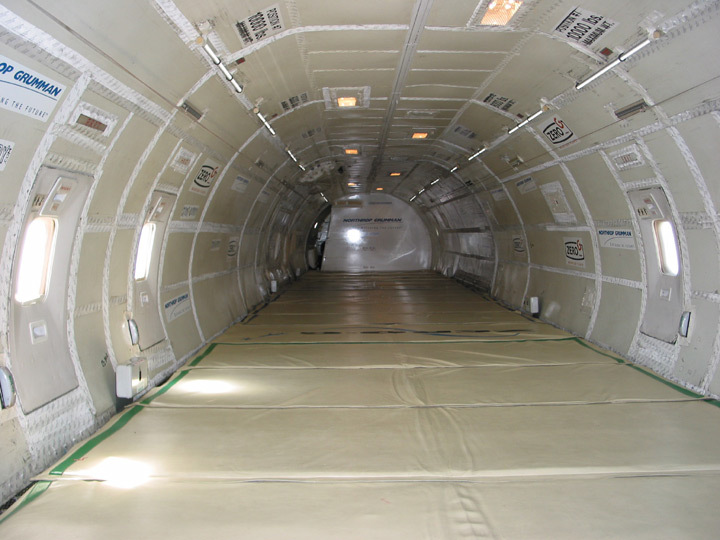 To help passengers ease into the experience aboard Zero G's plane, passengers are given a good preparatory session, told what to eat, not to eat (some food is better than no food) and, should they so desire, access to prescription pharmaceuticals (Scopolamine via their family doctor's prescription) or over the counter pills such as Dramamine. I don't like taking this sort of stuff so I did the flight all-natural. Passengers are coached to be aware of the changes they will feel and to be thinking that this is very much an issue of your brain telling you that something is wrong when indeed nothing actually is. All of this is psychological to a great extent. Before the flights, everyone from the Northrop Grumman/Zero Gravity team is upbeat about the impending flight telling people that they will have a great time and that they won't get sick. After I flew, I found myself offering the same advice to people about to fly. I think it has a substantial and positive effect. But there is more to this than just psychology. Working on the factors that affect physiology is also important. Drugs are one approach. Teaching people how to act and think is another. Yet another tool is to adjust the experience such that people find it easier to adapt - and then have fun. As such, the first 5 parabolas are flown at fractional gravity. The first one is at Mars gravity (0.38G) followed by four at lunar gravity (0.16G). Once passengers have adapted to the transition the remaining 10 parabolas offer 25 seconds of pure weightlessness. Some times, if FAA flight plans allow, an extra couple of zero G sessions can be flown. I decided that I would rather risk getting sick than taking drugs and feeling weird for several days because of the drug. Besides, having never been motion sick, I wanted to see how my body reacts on its own. I did exactly what I was told - to the letter and I not only felt fine, I had a magical experience. As you prepare for the first high gravity period - the part of the ride where you can get into trouble - you are coached to lie on your back, look straight up at the ceiling, pick a point, and focus on it. Head motions - especially back and forth movements - are discouraged. This way you do not overload your vestibular system with cues that it cannot process comfortably. If all goes well - as it seems to have done for everyone on the flight - by the time weightless conditions exist you can float up and have fun. Alas, as I mentioned before, the exposure is fleeting. While part of this project is to allow teachers to actually experience weightlessness - and to have fun in so doing - they are also expected to do a demonstration or experiment to aid in their future classroom instruction. Prior to each flight teachers are provided with a workshop wherein they are given an orientation to the program and are given a tutorial on weightlessness and how it can be used to teach various principles in physics, math, and engineering. The teachers then go back to their schools and work up an experiment or two that they will perform on the weightless flights. Many teachers involve all of their students in the selection and refinement of experiment ideas. Some are simple, others are complex, and a few are downright brilliant. Again, we are talking about some of the brightest teachers in America. The experiments I saw were tried and true - but were very illustrative of just what is involved with exposing people and things to weightlessness. One teacher had a weight on a simple scale, which clearly showed when gravity had decreased or disappeared (as far as the object's weight was concerned). Another teacher had a large bicycle wheel, which he used to demonstrate how a spinning gyroscope maintains a stable orientation (this principle was also addressed with a CD player). Other teachers mixed fluids, measured acceleration levels, or photographed other objects as they were exposed to weightlessness. I was reminded of how the Apollo 15 astronauts confirmed Galileo's postulation that a feather and a heavy weight should fall at exactly the same rate in a vacuum - in this case, on the surface of the Moon. And they did. Sometimes it is simple demonstrations - in exotic locations -, which can have the most dramatic instructional benefit. This flight was no different. If nothing else, however, just seeing your teacher in such a unique location - or "lifting" another person with a single finger - has a propensity to grab the attention of students in a way teachers only dream of experiencing. In my case I became a dumb weight for MSNBC's Alan Boyle to use in a video he shot. Without exception, the teachers all spoke very highly of the program and of the value it will add to their teaching. In Cleveland, John Fellenstein, a teacher at the Cleveland Early College High School in Aurora, Ohio said that the experience he had was "incredible" He added that as a result of his participation "I feel that I can do so many things with my kids starting with the video that we got from the flight - as well as to get them excited about careers in math and science and the space program. You know, it would be wonderful to see one of my students actually pursue a career as an astronaut or be involved in the space program in some way." Another teacher on the Cleveland flight, Russell Billings, from Kearsley High School in Davison, Michigan, was so enthused by the prospect of flying in this program that he asked if he could get his flight suit early. He wore the suit to the first day of classes and then announced to his students that they had only a few days in which to design an experiment for him to perform in weightlessness. After the flight, Billings said that the flight was "outstanding". He said, "I teach physics - and it's all theoretical. But here I have a real experience. Instead of just talking about being weightless I've actually experienced it myself. So I can translate that to my students as someone that has actually experienced it - and that it's not like something that is just in a textbook - it is real. Hopefully, that will help me to motivate the kids." One of the more profound revelations comes from Allan Miller. Miller has been teaching for 20 years and comes from Sterling, Alaska. He flew with me on a weightless flight out of Cleveland - and again, two weeks later, on a flight out of Washington Dulles. Miller is currently an Einstein Distinguished Educator Fellow at the National Science Foundation where he is working to improve science, technology, engineering and math education programs in K-12 schools around the country. Referring to the current generation of students, he said, "What keeps me going is that this generation is going to walk on the surface of Mars." Miller was selected originally as part of NEAT - the NASA Network of Educator Astronauts. From a group of 30 finalists (Miller was one of the finalists) several members went on to become educator astronauts. Those who were not selected continue to be closely involved with space education. Describing his experience on these flights, Miller said "In my classroom I keep a poster on my wall - of Albert Einstein. It says 'imagination is more important than knowledge'." When Miller described what he thought think about what he personally gained from the weightless flights he said, "I have been teaching for 20 years about Newton's laws. I have been teaching about microgravity. What I discovered right at the top of that first parabola with my body floating off of the surface of that airplane was that I didn't know microgravity at all. I knew it in my brain - but I did not know it in my heart. I really couldn't relate that experience. I did not have an imagination that could come to that. And once I floated for a while I truly felt like I understood it." Northrop Grumman has already received some rather potent feedback on these flights from the participants. At the Cleveland flight event, Art Stephenson, currently Sector Vice President for Space Exploration Systems at Northrop Grumman (and former Center Director of NASA's Marshall Space Flight Center) said, "the impact that the Northrop Grumman Flight of Discovery program had on the teachers has been fantastic. I have heard all kinds of things from teachers that have been fed back to us after the experience about how they've come to their classroom with this experience and how excited the students have become." In Washington, Tom Vice said, "From the initial feedback we've received, we're confident that we've given the next generation of space explorers a flying head start on learning that math and science are not only fun, but cool. We expect that many of them will go on to make significant technical contributions to the nation's future and its global competitiveness." Northrop Grumman has already started to move beyond this weightlessness program. Allan Miller and his students are now planning to conduct their own microgravity experiment aboard a NASA sounding rocket in 2007. A new grant provided by Northrop Grumman is helping Miller to conduct this project. No one from the Northrop Grumman/Zero Gravity team would confirm, but many expressed clear hope that this was not the end - but just the beginning of a program. I sought out Northrop Grumman's Alan Ladwig about the core inspiration for this program. Ladwig is currently Northrop Grumman's Manager of Washington Operations - but I have known him for more than 30 years, having met him as a student myself. Among his activities over the past three decades there has been a constant stream of prominent educational activities such as SEEDS (which flew tomato seeds in space for students) - and the Teacher in Space project, which culminated in the selection of Christa McAuliffe and Barbara Morgan (as McAuliffe's back up). Christa McAuliffe, of course, began her trip to teach in space, but never made it there. Morgan will soon pick up where she left off on STS-118. I asked Ladwig "this seems to be a logical extrapolation of NASA's teacher in space program - except that it is more like 'everyone's teacher in space". Did that sort of thinking go into this? Ladwig replied: "Actually when Tom Vice came up with the idea of having this be dedicated to teachers, I don't think he knew that much about NASA's teacher in space program. As I explained to him, in my previous role with the teacher in space program, we saw how this is so much bigger than that. It is great that Barbara Morgan is going to get to fly and eventually, that the other educator astronauts will be able to fly. 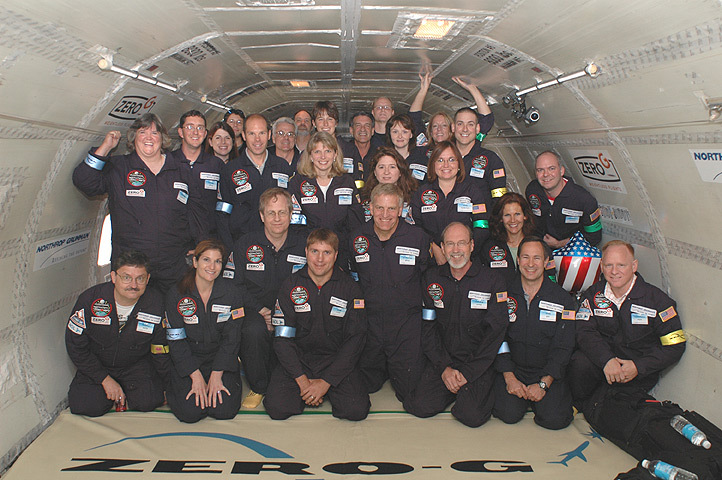 But through the Zero Gravity experience you get to fly such a large number of teachers. We have flown over 250 teachers on these 12 flights. And that has an even bigger impact of making more teachers the heroes for their students." Ladwig mentioned that there'd be some Northrop Grumman participation in a nation wide project with the National Science Teachers Association in concert with Barbara Morgan's flight. An announcement of that project is expected some time in the next month or so. In addition to flying teachers, a number of reporters were also allowed to fly and not only experience weightlessness - but also the activities and reactions of the teachers as well. While reporters are there to be observers, the act of participation was simply impossible not to describe from a personal level. Although he has not written his own article yet about the experience, AP's Seth Borenstein shared a few initial reactions a few minutes after landing. I asked Seth "was it life altering?" "No" he replied. "Was it different?" I asked. Seth replied, "It certainly helped me understand everything that I have been told. Hearing about it is one thing, but feeling it is another." When I asked "What are going to do with this other than write about it?" Seth replied, "I am hoping to dream about it." "Are you going to do something with your Cub Scout pack? Your kid's school?" I asked "Yea. I am going to take a video and show them. My kid's principal wants me to get some applications for his teachers - and for him."